Political criticism is our enemy's best friend. According to Fascism, a true, a great spiritual life cannot take place unless the State has risen to a position of pre-eminence in the world of man. The curtailment of liberty thus becomes justified at once, with this need of raising the State to its rightful position. For the discerning talk radio consumer, Dennis Miller's Mensa-level snarkiness plays much better than Sean Hannity's pugnacious ignorance. But take away Miller's wit and literacy, his ability to speak in complete sentences, and his ability to refine GOP talking points into something that sounds like his personal opinions, and what remains is pretty much the same message Hannity feeds tirelessly to the mouth-breathing cultists who compose his core audience: The President's gotta keep that pimp hand strong, or the “Islamo-Fascists” will defeat us. In Rudolph Giuliani, both Hannity and Miller see George W. Bush's ideal successor. Hannity, aware that his core audience cares about such things as abortion and traditional marriage, does cavil somewhat about Rudy's, shall we say, unconventional personal life (imagine the sitcom version of Jerry Seinfeld as a sociopathic politician with the world's least persuasive comb-over, and you've got Mayor Rudy) and his liberal views of social issues. But the important thing, Hannity insists, is that the next president focus primarily on fighting the war on terror, both at home and abroad. Miller is refreshingly candid about the same priorities – which define the president Republican agenda. 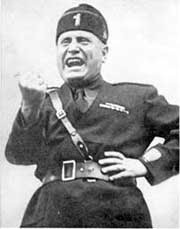 Dispensing with all pretense of concern about social issues, Miller believes that the public is ready for an unapologetically authoritarian president, and, in Giuliani, Il Duce and the moment have met. Portrait of Il Duce as La Regina: Rudy in drag. 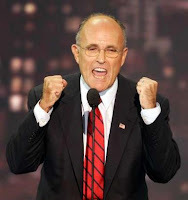 Giuliani, it must be said, is certainly not reluctant to hymn the praises of authority. Authority is the exclusive possession of the political class. Individual responsibility, respect for the law, and ethics are for the lesser beings who don't belong to that exalted caste. Six years after offering his little tutorial about “individual responsibility... respect for the law and ethics,” Giuliani appointed to the post of NYC Police Commissioner a man he knew had ties to organized crime. Bernard Kerik's chief qualifications for that post, according to his detractors, were his canine loyalty to Giuliani and his gift for self-promotion. He became Giuliani's driver and bodyguard during the 1993 mayoral campaign, after which he was appointed head of the Corrections Department, where he reportedly did a more than adequate job, although he turned the department (and a related foundation over which he presided in an apparent conflict of interest) into a patronage pinata. Kerik “spent much of his own term [as Commissioner] writing an autobiography,” notes Fred Kaplan of Slate. This involved, among other things, sending police officers to Ohio to pin down details about his long-deceased mother, and using others (including a homicide investigator) to track down his publisher's missing cell phone. One wonders how much “respect for law” Kerik displayed as Police Commissioner by using police officers as research assistants and errand boys. But under the Giuliani doctrine, such questions are moot, at least as they apply to those clothed in the State's authority. 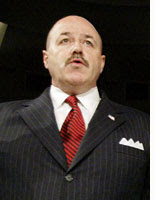 Apart from swaggering around the country in a Kevlar vest, with a handgun strapped to his side and surrounded by a posse of South African mercenaries, Kerik did little during his three-month tour (originally scheduled to be six months in duration, which was roughly one-third the time serious analysts thought would be necessary to get Iraq's civilian police system operating) as Iraq's interim Interior Minister. This week's murderous police rampage in Tal Afar offers one measure of Kerik's success in reconstituting Iraq's police force. Like Zoe Baird, one of Bill Clinton's failed Attorney General nominees, Kerik was caught in a “nanny trap” and was forced to withdraw. It's likely that the Republican-dominated Senate would have confirmed Kerik despite questions about the immigration status of one of his part-time housekeepers. I suspect that Kerik withdrew because his confirmation hearings, however perfunctory, would likely have exposed a great deal more about the squalid underside of the emerging Crony Capitalism/Garrison State Regime – more than its rulers were comfortable disclosing at that time, in any case. What role would Kerik play in a Giuliani administration? This would largely depend on the make-up of the Senate, of course. It's unlikely that Giuliani would nominate him for a position that requires Senate confirmation, but the metastasizing Homeland Security bureaucracy would offer plenty of other patronage options. If the GOP nominates Giuliani, it will ratify the Giuliani dichotomy as official party doctrine, which could be summarized thus: Those in power can do as they will; those against whom power is exercised must simply endure it. Please visit The Right Source -- and check out the second issue of the Pro Libertate e-journal. 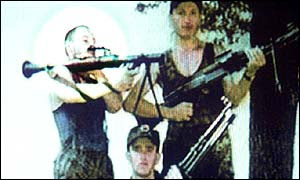 At left: Hicks as a volunteer for the "Kosovo Liberation Army" in 1999 -- when the terrorist group was an ally of Washington in its war on Yugoslavia. David Hicks, the Australian national who inexplicably became a convert to Jihad-centered Islam, is the first person to be found guilty of terrorism-related charges under the terms of the Military Commissions Act (MCA). First, although he pleaded guilty – following five years of detention and the dismissal of most of his legal counsel by the presiding judge -- to the charge of “providing material support for terrorism,” Hicks wasn't accused of plotting to attack the United States or any American citizen. 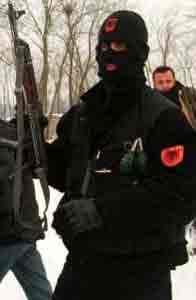 Second, Hicks began his career as a Jihadi working with the so-called Kosovo Liberation Army (KLA), which may be the only Islamist terror group accurately described as “Islamo-Fascist.” The pedigree of that organization, as New York Times foreign correspondent Christopher Hedges pointed out in the late 1990s, is traced on one side to the worst elements of Stalinist Marxism, and on the other side to the Skanderbeg militias organized by the SS in the Balkans during World War II. So it does no violence to the facts to call the KLA “Islamo-Fascist,” although “Islamo-Leninist” would still be a better description. And it should not be forgotten that at the time Hicks was working with the KLA, the group was likewise receiving material assistance not only from Osama bin-What's-His-Name (you know, the Guy Bush Doesn't Worry About), but also from Washington and London. It has been said that the crime of terrorism consists of privatizing the official violence routinely practiced by governments. And most terrorist groups of any consequence work as subcontractors for national governments, or international alliances of some kind. This was very much the case with the KLA, which was used by Washington and London as the spearhead in an attack on the former Yugoslavia. After being thrust into power by the 1999 NATO terror-bombing of Serbia, the KLA proceeded to terrorize Kosovo's Christian Serbs, as well as the peaceful Albanian Muslims living in that Serbian province. The group is now entrenched as the UN-installed government of Kosovo. David Hicks reportedly went to Kosovo to train with the KLA in 1999 – which means that he was giving material support to a terrorist group that was an ally of Washington (and that he may in fact have been working with CIA operatives who were providing training and assistance to the KLA at the time). Hicks was working as a horse trainer in Japan when he learned about the KLA. In a letter to his parents he explained that he had joined the group (“I thought it was an airline,” his father later explained) to fight the Serbs. Since fighting the Serbs – who had been routinely demonized in the western media as the Nazis reborn -- had been official U.S. policy for several years, it's reasonable to say that it was Washington that recruited Hicks into the ranks of Jihad. After converting to Islam, Hicks went to Pakistan where he joined a Kashmiri Islamic separatist group called Lashkar-e-Toiba (LET, or “Army of the Pure”).The LET aspires to convert India into a Sharia-ruled Islamic state, and it has provided support to Islamic rebels in Chechnya, but it displays no documented interest in attacking the US. While fighting with the LET, Hicks reportedly got off a few rounds in the direction of Indian forces in Kashmir, but did nothing to molest any American citizen in any way. Hicks migrated to Afghanistan in 2000 and became a convert to Taliban-style Islamic fundamentalism. Following the 9-11 attacks, he telephoned his father to tell him that he was going to be fighting on behalf of the Taliban against the Northern Alliance. He was captured by the Northern Alliance outside Kandahar in December 2001, and turned over to US custody. The dossier on Hicks claims that he was at some point trained by al-Qaeda, and that he helped conduct surveillance on US and British embassies in Kabul. If true, this suggests that Hicks was well on his way to becoming a full-fledged anti-Western Jihadist by the time he was captured by the Northern Alliance. But it shouldn't be forgotten that he was sucked into an Islamist pipeline that was created primarily by Washington – which sponsored the KLA, and also created the Mujahadeen network from which both the Taliban and al-Qaeda sprang. Should David Hicks have been prosecuted? Definitely – by the Serbs, or by the Indian government, both of which have jurisdiction over any terrorist of insurrectionist acts in which Hicks was implicated. Perhaps he should have been turned over to Australia for trial. But unless we are to assume that Washington has universal jurisdiction, it had no business detaining and trying Hicks – a foreign national – for alleged offenses committed in the Balkans and Central Asia. And if Hicks is to be regarded as a terrorist for lending material aid to the KLA, then he should have enjoyed the august company of some celebrity co-defendants in the dock – Bill Clinton, Madeleine Albright, William Cohen, Tony Blair, George Robertson, Javier Solana.... The list would be quite impressive, and the resulting spectacle most satisfying. 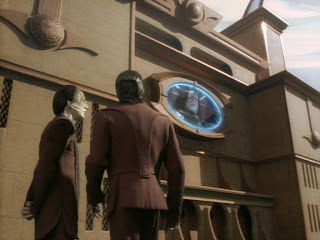 Cardassian "Court TV": Residents of Cardassia Prime watch a show trial intended to make vivid the infallible wisdom of the State. The military commission that “tried” Hicks is a “prerogative court” akin to the notorious Star Chamber – a burlesque of a judicial body, one that exists only to ratify the executive's will, rather than to determine facts and do justice. It is the lineal descendant of the Soviet “justice” system, a real-life analogue of fictional Cardassian tribunals, in which the objective is to demonstrate the State's infallibility – and the “defense” counsel's role is to help the defendant understand and accept the State's wisdom. This was made clear by the treatment of Hicks's legal counsel, two of whom were dismissed by the presiding military judge for arcane and whimsical reasons. In fact, Hicks's chief counsel, Joshua Dretel, was dismissed because he refused to sign a document agreeing to abide by court regulations that have not yet been written. Every single element of the indictment against the ICC applies to the legal system being created by the Bush Regime in the name of fighting terrorism. Many of the same people who denounced the ICC are volubly applauding the version of the same pseudo-judicial abomination created through the Military Commissions Act. The ICC could be considered a threat to Americans, albeit one that's a cloud on the horizon the size of a man's hand. 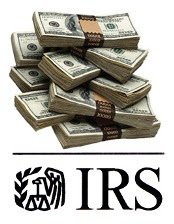 The MCA, however, is an immediate threat to Americans, or anyone else, who attracts the malign attention of Washington. People who ignore or fail to understand this, I suspect, have been osculating the Dear Leader's posterior for so long they've simply become inured to the pungent odor of totalitarianism. Be sure to check out The Right Source -- and look for a new issue of Pro Libertate (the e-zine) very soon. Scott Horton of Antiwar.com kindly invited me to be a guest on Antiwar radio to discuss the outrageous killing of Derek Hale. 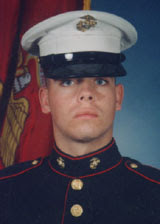 Hale, a retired Marine Sergeant who served two tours in Iraq and was decorated before his combat-related medical discharge in January 2006, was murdered by a heavily armed 8-12-member undercover police team in Wilmington, Delaware last November 6. He had come to Wilmington from his home in Manassas, Virginia to participate in a Toys for Tots event. Unknown to Derek, he had been under police surveillance as part of a ginned-up investigation into the Pagan Motorcycle Club, which he had joined several months before; the Pagans sponsored the “Toys for Tots Run” that had brought Derek to Delaware. As with any biker club, the Pagans probably included some disreputable people in their ranks. Derek was emphatically not one of them. On the day he was killed, Derek had been under both physical and electronic (and, according to the civil complaint, illegal) surveillance. Police personnel who observed him knew that his behavior was completely innocuous. And despite the fact that he had done nothing to warrant such treatment, he was considered an “un-indicted co-conspirator” in a purported narcotics ring run by the Pagans. The police vehicles screeched to a halt in front of the house shortly after 4:00 p.m. They ordered Lopez and her children away from Derek – who, predictably, had risen to his feet by this time -- and then ordered him to remove his hands from his the pockets of his sweatshirt. 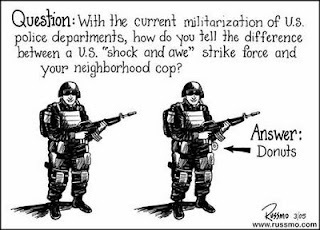 At this point, one of the heroes in blue (or, in this case, black) swaggered over to Mixon and snarled, “I'll f*****g show you overkill!” Having heroically shut up an unarmed civilian, the officer turned his attention back to Derek – who was being tased yet again. According to Sgt. Steven Elliot of the WPD, Brown slaughtered Derek Hale because he “feared for the safety of his fellow officers and believed that the suspect was in a position to pose an imminent threat.” That subjective belief was sufficient justification to use “deadly force,” according to Sgt. Elliot. The “position” Derek was in, remember, was that of wallowing helplessly in his own vomit, trying to overcome the cumulative effects of three completely unjustified Taser attacks. As is always the case when agents of the State murder an innocent person, the WPD immediately went into cover-up mode. The initial account of the police murder claimed that Derek had “struggled with undercover Wilmington vice officers”; that “struggle,” of course, referred to Derek's involuntary reaction to multiple, unjustified Taser strikes. The account likewise mentioned that police recovered “two items that were considered weapons” from Derek's body. Neither was a firearm. One was a container of pepper spray. The other was a switchblade knife. Both were most likely planted on the murder victim: The police on the scene had pepper spray, and Derek's stepbrother, Missouri resident Jason Singleton, insists that Derek never carried a switchblade. 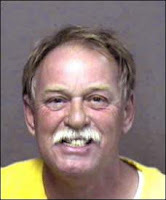 Within hours, the WPD began to fabricate a back-story to justify Derek's murder. 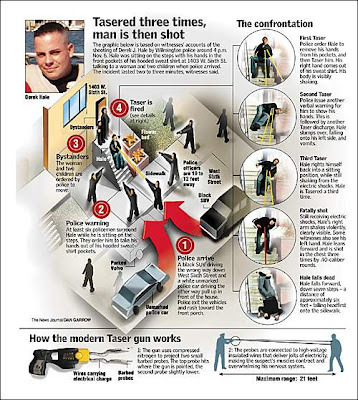 Several Delware State Police officers – identified in the suit (.pdf) as “Lt. [Patrick] Ogden, Sgt. Randall Hunt, and other individual DSP [personnel]” contacted the police in Masassas, Virginia and informed him that Derek had been charged with drug trafficking two days before he was murdered. This was untrue. But because it was said by someone invested with the majestic power of the State, it was accepted as true, and cited in a sworn affidavit to secure a warrant to search Derek's home. Conducting this spurious search – which was, remember, play-acting in the service of a cover story -- meant shoving aside Derek's grieving widow, Elaine, and her two shattered children, who had just lost their stepfather. Nothing of material consequence was found, but a useful bit of embroidery was added to the cover story. The Delaware State Police officers are guilty of misprison of perjury, as are the officials who collaborated in this deception. And it's entirely likely that the Virginia State Police had guilty knowledge as well. As we've seen, Hale did not resist arrest, as everyone on the scene knew. And he was not at the “center” of any investigation; before his posthumous promotion to “un-indicted co-conspirator,” he was merely a “person of interest” because of his affiliation with a motorcycle club. Last Friday (May 23), the Rutherford Institute – one of the precious few nominally conservative activist groups that give half a damn about individual liberty – and a private law firm in Virginia filed a civil rights lawsuit against several Delaware law enforcement and political officials on behalf of Derek's widow and parents. They really should consider including key officials from the Virginia State Police in the suit, as well. According to the lawsuit, Lt. Brown, Derek's murderer, “has violated the constitutional rights of others in the past through the improper use of deadly force and has coached other WPD officers on how to lie about and/or justify the improper use of deadly force.” Rather than being cashiered, Brown was promoted – just as one would expect of any other dishonest, cowardly thug in the service of any other Third World death squad. 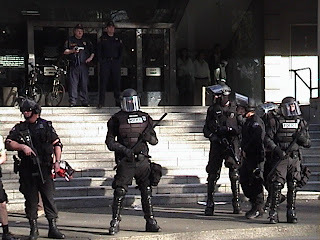 Check out The Right Source for news, commentary, and talk radio -- and an action agenda listing some small but significant steps we can take to battle our descent into police-state hell. How Parliament disposed of that tyrant's claims of "executive privilege"
“Treason is a matter of dates,” insisted Talleyrand, who despite being a physical cripple was ideologically double-jointed and thus (unlike many of his revolutionary comrades) was able to keep his head attached to its neck. White House spokesliar Tony Snow displays more than a touch of Talleyrand in his ardent defense of what he once reviled – the concept of executive privilege. Nearly a decade later, as the spokesman for a regime whose criminal behavior eclipses that of the Clintonites, Snow has discovered that the concept of executive privilege is the highest and most sacred governing principle. Snow's comment was one of those instances in which the essential fascism of the Bush regime vents to the surface, in the fashion of a gust of superheated, toxic gases seeping to the surface as an overture to a volcanic eruption. From the Bushevik perspective – which is the distillation of the power-obsessed cult that conservatism has become – the presidency is a self-existing entity superior to every institution under heaven (and, on a good day, superior in some respects to Providence Himself). This doctrine is alien to our Constitution, and to the Anglo-Saxon tradition of liberty under law. It does have a precedent, however, in the royal privilege claims asserted by King James I, the sexually depraved early 17th Century English monarch, in his essay Basilikon Doron, a document intended to tutor his son in the ways of royal absolutism. The doctrine contained in that tract was nothing less than a prototype for the modern totalitarian concept of Fuhrerprinzip. Charles I was, in every significant way, a precursor to George W. Bush. Angered by these usurpations, and anxious to preserve the liberties won at Runnymede, Parliament enacted a document called the Petition of Right, intended to provide statutory protection for ancient rights; it reaffirmed the habeas corpus guarantee, extended protection against the quartering of troops in civilian homes, and prohibited the king from imposing martial law in peacetime. Charles suffered the Petition's enactment, and promptly dismissed it. Eventually he dissolved the Commons, and during the entire decade of the 1630s refused to convene Parliament, ruling as a royal dictator. 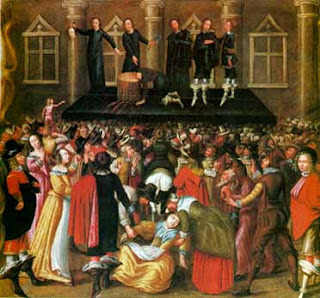 In 1642, the conflict between the Parliament and Throne blossomed into full-fledged civil war, which culminated with the trial, conviction, and execution of King Charles for treason. “It had been with the criminal object of securing unlimited and tyrannical power that Charles I had levied war against Parliament and had set out to destroy the very people whose life and liberty he was obliged to preserve,” writes Robertson. There is no reason to believe that Bush is less than deadly serious about his intent to deflect congressional subpoenas to protect his courtiers. Previous presidents who have dealt with similar challenges – Nixon, during Watergate; Reagan, during Iran-Contra; and even Clinton during the Lewinsky disgrace – have eventually deferred to Congress, rather than defying it. Bush will almost certainly defy Congress. And if the conflict escalates further, he may eventually have to exercise the usurped powers he claimed last October 17, when he signed into “law” two measures that would establish his own version of the Star Chamber courts and use the National Guard as his proprietary army. Even if he should decline to employ such severe means, George W. Bush, like his predecessor Charles I, would have to make war on the legislative branch -- either literally or in everything but name -- in order to defend royal prerogatives alien to our Anglo-Saxon heritage of law. That was treason in 1642, and it remains treason today – the sophisms of Talleyrand and Tony Snow notwithstanding. Please visit The Right Source for freedom-centered news, commentary, talk radio -- and an action program to take back our liberty. John Coffin heard his wife Cynthia screaming. After racing to the garage, he saw her prone, agonized form pinned to the floor by two armed strangers who had violated the sanctity of his home. Despite the fact that he was an unarmed, 55-year-old heart patient, Coffin did the right thing: He beat the intruders to within an inch of their lives. As it happens, the thugs who assaulted Coffin's wife, Cynthia (a nurse with no criminal record) were deputy sheriffs who had visited the home to serve John with a restraining order filed in a landlord-tenant dispute last April. Coffin had been served the same papers a few days earlier. When Cynthia answered the doorbell and was greeted by deputy James Lutz with the TRO papers, she told him that John was in the bathroom. She then shut the door – which is exactly the right thing to do, given that police are now trained to seize on any opportunity to conduct a “consent search” -- and went to find her husband. She also began to lock other doors and close blinds; this is also entirely appropriate. Why were the Coffins so leery of police? Like an increasing number of honest, unassuming Americans, the couple had noticed that the police have turned feral. Their knowledge of this unfortunate fact is not derived from headlines, but rather a product of an unjustified assault John experienced in October 2003 after an unnecessary traffic stop conducted by a 24-year-old deputy named Grant Steube, who claimed that there was a problem with the license tag on John's car. At the time of the stop, John was in his sister's driveway. He got out and demanded to know what the problem was. Steube ordered John back into his car and then – without legal cause or provocation – pepper-sprayed the then-52-year-old man, and then beat him repeatedly with a metal club called an asp. 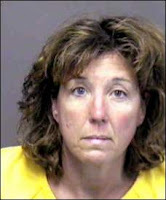 Steube later admitted – gee golly Ned, oopsie-daisy, my bad, and all that – to misreading the license tag. As is always the case in such incidents, it was the victim of state-authorized violence who was charged with “resisting arrest” and “obstruction” of a police officer, but those charges were dropped. Steube, the assailant, was never charged or sanctioned in any way, (reg. required) and a lawsuit filed by the Coffins was summarily dismissed. Given this history, it's understandable that the Coffins would treat an encounter with the Sheriff's department the way they did during the incident last April. When John didn't materialize at the front door as quickly as Deputy Lutz thought he should, he summoned Deputy Stacy Ferris (a she-police, and hence useless). The two of them decided to invade the Coffin property without a warrant, by walking into the couple's garage. When Cynthia confronted them about their crime, she was threatened with arrest if she displayed “further resistance” -- a characterization containing a lie, since she had not “resisted” anything. As she turned to go back into the house, Cynthia was seized by the deputies and placed “under arrest,” which in this case means she was assaulted and kidnapped without legal cause. When she struggled to get away, the deputies threw her to the garage floor, dislocating her arm. Her screams summoned John, who dispatched Deputy Stacy with a blow to the face, then grabbed her Taser and used it as a club on Deputy Lutz. After a brief struggle, Lutz pulled his gun and arrested John. Last week, in a ruling as unexpected as it is uncommon and badly overdue, Circuit Judge Rick De Furia threw out all but one of the six charges against John Coffin (the surviving charge dealt with taking the Taser from one of the deputies) and reduced his sentence to the eight days he had served in jail and $358 in court costs. “Law enforcement was responsible for the chain of events here,” ruled De Furia. The critical fact is that the deputies “broke the law” by invading the garage without warrant or probable cause; they committed an armed home invasion, and criminally assaulted an innocent woman. 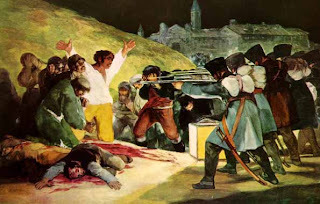 Given the nature of the crime committed against his home, Coffin had a moral and legal right to gun down the invaders, irrespective of the costumes they were wearing. Given that I prefer not to see anybody violently killed for any reason, I admire and appreciate the restraint – and the courage -- he displayed in merely beating them severely. The right to resist is what separates a citizen from a slave. 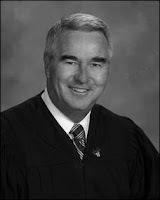 God bless John Coffin for exercising that right, and Judge De Furia for recognizing and protecting it. And let us pray that, somehow, the right to resist illicit state violence will likewise be recognized in the case of Cory Maye, before that young man is murdered by the State of Mississippi for the supposed crime of defending his home. Be sure to visit The Right Source for news, commentary, and talk radio from a freedom-centered perspective.